Hostel Home has 4 rooms. First and the biggest one is a 8-bed room with 2 clean and cold-proof windows. Second is 6-bed room with 1 window. 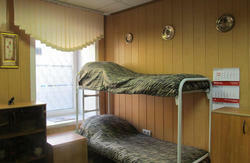 Third one is 4-bed room, and it has a specific, fashionable, hand-made, huge and comfortable beds. each bed has its own curtains, which can protect your dreams from outside disturbance. Moreover it has a big table with few chairs. And last room is a room for couples, which is equipped with a big bed and closet. 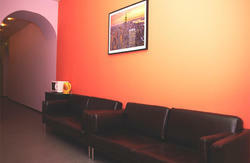 Hostel provides to each guest a safe locker for personal belongings. All bed has a clean and new linen with a warm and nice blanket. Lavatory and shower are separated. Hostel's stuff always keep them in a clean and shiny conditions. Big shared kitchen has all necessary facilities like fridge, stove and oven, sink, all kind of dishes, tv, microwave oven, big table with chairs. Also it has a nice ventilation system. In front of our front door there are 2 grocery shops (one of them is open 24 hours 7 days a week), Chinese restaurant and a pub. However, as you can understand the main prospect (Nevskii prospect) of the city has an excessive possibilities for leisure, entertaining and shopping. 2 the most biggest shopping malls (Stockman, Galeria) are situated there, thus you will have an access to all facilities you want. Unfortunately we do not provide 'pick up' facilities yet. The easiest way to get to our Hostel is to use Metro. The nearest station is “Ploschad Vosstania” (Red line). This station is near the biggest railway station called Moskovskii vokzal. From there you take Nevkii prospect facing EAST until cross road with Poltavskaya street. From there you turn LEFT and go STRAIGHT! After so-called triangle crossroad Poltavskaya street will change into Mitninskaya street, all you have to do is GO STRAIGHT and be welcomed at Hostel Home!